Home / The Buzz / Jasper finds Guru! Jasper Harvey is a fussy little thing. When he wakes up, he must complete his routine of going to the toilet (hopefully outside,) playing with his micro-fibre monkey, having a chill with Mummy, and munching on his breakfast. For such a picky cockapoo, the final stage of the process has always been a bit of a hassle. When we first brought him home, he’d been on a vet endorsed brand that we’d assumed (as you would) would be great quality. For the first few weeks of Jasper’s time with us, he stank like you wouldn’t believe. Desperately googling whether this was normal just to be told that most people love the way their puppies smell was not constructive to say the least. After both the expense and the effects of the vet endorsed food were considered further, we decided it was time for a change. We visited our local independent pet shop and were encouraged to try a hypoallergenic brand. This seemed to improve on the smell, but we were concerned that the brand was completely unheard of. We used the website ‘all about dog food’ which didn’t even show the brand as being rated at all. We were in the market for a healthy, credible dog food that didn’t make our cockapoo smell like the latter part of his name. That’s when we found Guru. There’s a Facebook group in the UK for cockapoo owners (highly exclusive, top secret establishment i’m sure you can tell) in which a great deal of owners recommended Guru to us. Naturally, we visited the All about dog food website to find that Guru cold pressed dog food is rated 4.9 out of 5, compared to the 2.6 of our first food. That was all the persuasion we needed. 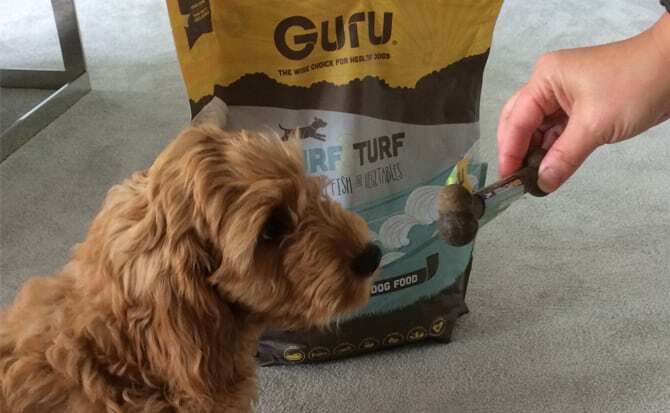 We instantly dove into researching Guru and found that it comprises of healthy ingredients that are hypoallergenic and cold pressed, meaning they retain all the lovely nutrients our doggies need. Well Jasper just loves it. At first, we ordered some sample packs and have been gradually increasing the amount of Guru the pup has, and he smells better than ever. We love the fact that we know exactly what’s in his food now and that our little boy is being fed natural and nutritional ingredients. We’re looking forward to trying the trip bones that Lisa so kindly sent us, and also tasting all the different types of flavours of Gurulicious goodies!